Leslie Svacina, a five-year Farm Bureau member, is no stranger to agriculture. She and her husband Scott recently started their own herd of meat goats. Today they have 13 head and have made plans to start grazing and build their herd to 100 head. The couple also collects maple sap and sells it to a local syrup processor. They also have a four-month-old son, Cody. 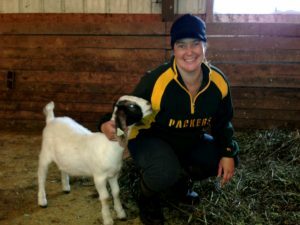 When not tending to the goats, Leslie works at the University of Minnesota as an internship coordinator. She works with students from the College of Food, Agriculture and Natural Resources who are completing internships. Scott works for CHS in the refined fuels area. When not at the farm or assisting students at the University of Minnesota, Leslie is involved with the New Richmond FFA Alumni, is a Wisconsin FFA Association volunteer, serves on the UW-River Falls Alumni Advisory Board and the UW-River Falls College of Agriculture, Food and Environmental Science Alumni Board and is a past president.